I grew up in St. Louis, Missouri, so for most of my life, I didn’t have a very positive view of rivers. I understood the historical and commercial importance of the aptly-named “Muddy” Mississippi, for example, but it was still extremely ugly to me, as were most of its tributaries. To be sure, it wasn’t until I started traveling in my early 20s that I realized rivers didn’t have to be ugly, let alone brown. As it turns out, rivers occur in a whole rainbow of colors, as you’re about to see below. 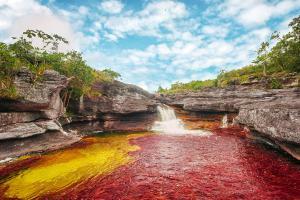 The literal translation of caño cristales is “crystalline tube,” or something close to it. The tangible manifestation of this phrase – when you lay eyes upon Caño Cristales, located in the Colombian Amazon more than a day’s drive from Bogotá – is something that’s nearly impossible to put into words. Well actually, it’s quite possible. Thanks to an endemic plant known as Macarenia clavigera, the river gains a pinkish-red tint from about July-November, which combines with its usual blue-green hue to give of a perfect prism of colors: A rainbow river, if you will. In the two decades that have passed since the end of conflict in the former Yugoslavia, tourism to the Balkan States has surged, to Bosnia and Herzegovina in particular. A major reason for this is the picturesque bridge in the city of Mostar – and a major reason that bridge looks so good is the bright blue-green waters of the Nereveta River, which flows directly below it. Costa Rica is full of natural wonders, so it should come as no surprise that the country gets a nod on this list. Although the name “Rio Celeste” might evoke something to do with the night sky, it actually translates to (daytime) “Sky Blue River,” which is the perfect description of this water. It’s so blue you’ll have a hard time believing it’s real, let alone differentiating it from the azure Costa Rican sky above you! If there’s one continent that disproves my childhood assumption about the muddiness of all rivers, it’s Europe. I can’t tell you how many times I’ve looked out my window while traveling across the continent by train and being literally unable to believe the beauty of the rivers I saw. 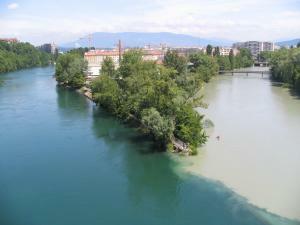 A notable exception to this rule is the Arve River, a muddy river that flows near Geneva, Switzerland. Of course, this is Europe, so there is an exception to the exception: The confluence of the Arve and the blue-green Rhone, the contrast between which is one of the most beautiful expanses of fresh water in the world. It probably won’t come as a surprise to you to learn what color Utah’s Green River is. What’s less expected of people who cool off from the desert heat in this body of water is how much more beautiful the green water looks when it contrasts with the extremely red desert around it. Although it’s unlikely that you would find yourself here during the month of December, you’ll definitely feel like it’s Christmas if you’re lucky enough to take a dip in the Green River.